Who doesn't love a good El Caminoized monster, something built from another vehicle and covered in crazy graphics...wait...you are saying this is stock? GMC did what now? Okay, got it. The GMC Caballero was a badge engineered version of Chevrolet's El Camino that different in little more than the nameplate. When Chevrolet released the Royal Knight edition, GMC wanted a similarly cool graphics package and named their badboy version the Diablo. 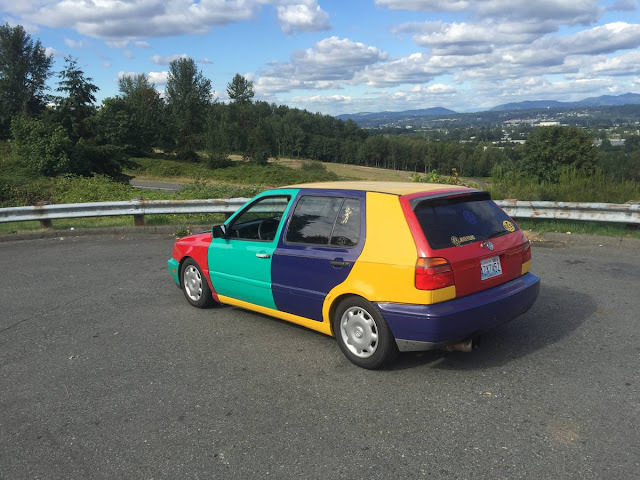 Find this 1980 GMC Caballero Diablo offered for $12,900 CAD ($10,384 USD at printing) here on kijiji located in Moncton, New Brunswick, Canada. 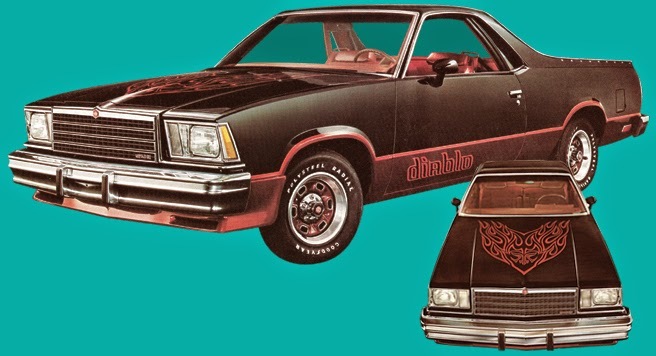 The Caballero shares it mechanical components with the 5th generation El Camino and the A-body Malibu. There are worse platforms to put a car on top, and the Caballero is cheap and easy to maintain for daily driving. No scrounging the junkyard like you own an 80s Saab, just head to your nearest auto parts store and pickup just about any part that will ever need replacement. This Diablo is free from the awesome hood graphics that was an option, but you can always pickup a set of stickers from phoenixgraphix. If this was mine, the flaming winged devil bird thing would be on this car faster than you can say "grow a mullet". Power for this Diabellero comes from Chevrolet's 305 cubic inch version of the small block V8. The 305 has its share of fanboys and detractors, but it is a reliable if underpowered V8 from the low compression-era. Expect around 150 horsepower and this one is mated to a 4-speed manual gearbox for tire shredding fun. The condition of this Caballero is very nice (inside and out) and it is probably one of the better examples you'll find outside of a museum or an asylum. Hat tip to K2 Mystery Car for recommending we look for a Cab-diabo. I stumbled upon this article while looking for design ideas for my very own 1980 gmc caballero diablo. upon further investigation i realized that this IS my very own gmc diablo. i bought the car in july of 2017 fro ma different owner. it is now black and you'll all be happy to know that it has the "Diablo" decals and a hood cowl now. This thing is two and a half hours from me. It sure looks nice but any car for sale here absolutely needs a PPI. The air is salty and muggy as to stick to any metal surface. They use road salt and if this is a Canadian car I'm sure in its early life it was a year round daily driver. But it could be, like so many older cars here was brought up from a more car friendly state. Still a PPI is a MUST. I have not been able to determine how many of the roughly 37,400 Caballero produced were sold as Diablos. The hood decal alone is worth another look. most had 305 v8s pretty sporty. they were rust dipped then primer dipped most were garaged well kept. In Canada I think it was known as the Guy Caballero edition. V8 engines WERE offered from the options list, though not as standard equipment.The V6 remained standard throughout the run. True, but I've been lead to believe that you could not combine the two (Diablo + V8) from the factory...though there's no reason you couldn't do it with help from the aftermarket, as DT pointed out. I also read that this and the Royal Knight were supposed to be "upgrades" beyond the SS, but I don't see how that could be with the V6. Not a lot of Diablo with this truck. Is this the market value now for this generation El Camino? I ask because there's a car lot near me with a 8 out of 10 black El Camino in great shape for $6k.